Skyline Church volunteers help provide a delicious meal for seniors and needy residents. 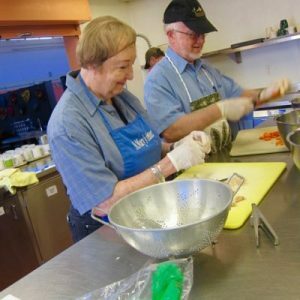 This is part of the Food for all Ages program by Sister Marilyn Medau –enriching the giver as well as the receiver. Skyline Church has participated for many years — it’s always great fellowship, fun, and spiritually rewarding. At Skyline, we’re committed to nurturing the spiritual development of children and youth by equipping them with the tools they need to discover faith-filled answers… for themselves. God has no hands but your hands, no feet but your feet, no face but your face. Join us in cultivating a more just and compassionate world, working together to understand and meet the real needs of our local community (Food Bank) and beyond (Sierra Leone School). We recognize the fragility of the earth and our own capacity to do harm. It is urgent that, as earth’s stewards, we make a commitment to our children and future generations to minimize our impact on the earth. We are working locally and globally in these efforts.